Opera 41 doesn't have any stellar new features, but it does improve performance for start-up times, battery life, and CPU usage. The latest version of the Opera browser just rolled out, promising faster start-up times especially for users who open numerous tabs at once. The new update, Opera 41, also boosts battery life when using video calling over WebRTC and when watching videos in pop-out mode. The major change for Opera 41 is a new “smarter startup sequence.” When you launch the browser it will automatically load the tab you were using most recently. Then Opera 41 loads pinned tabs (if you have any), and then the rest of your tabs in decreasing priority. Opera says that during its tests, start-up time in Opera 41 improved by 86 percent on average for a browser with 42 or more tabs open, compared to Opera 40. If you’re a more modest browser user with about 10 tabs open at once, the new start-up routine can still improve your “boot” time by about 50 percent. The story behind the story: Opera says the faster start-up time is all about reducing “as many pain points” as possible from the user experience. However, it’s not the first browser to offer a smarter tab-loading routine at start-up. Last September, Google rolled out Chrome 45 with a similar feature. Opera’s battery saver feature already did a nice job of extending battery life. Now Opera 41 offers a new hardware-accelerated feature that could help you take your battery even further on a single charge. When you initiate a web-based video chat via WebRTC, and if battery-saving mode is on, Opera will default to using a video codec that offers hardware acceleration if one is available. That should help make more efficient use of your system resources, which could save battery life. Opera will also try to limit the pixel count on your screen “to reduce CPU usage” when you’re in battery-saving mode. Pop-out video on Opera 41 will also use hardware acceleration. Introduced in May, pop-out video lets you put content from sites like YouTube in a borderless window that runs separately from the site it was on. Opera 40, by comparison, relied on software for displaying a pop-out video. The software approach can slow down your laptop’s performance, however—especially if you’re using low-end hardware. 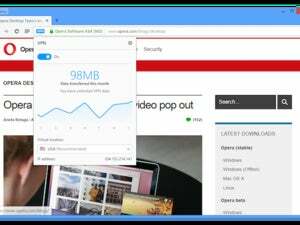 Opera says the newer browser’s pop-out video feature uses up to 30 percent less CPU resources than previous versions. Although it’s not the most popular of the major PC browsers, Opera has been steadily adding a solid roster of helpful features to win over users. Check out our earlier look at Opera’s standout features, such as a built-in VPN and native ad blocking.